You Gonna Eat All That? Frita Batidos — Review in February Current, Photo Essay here! Our Current review of Frita Batidos is up (for more descriptive details have a look and feel free to rate it), and here are our photos from that visit. This place has made it onto our short list at present, so we've been back there multiple times and can say that they're still good. We'd avoid them at peak times, though, because it gets crowded. Conch fritters -- very tasty! With various sauces. A flock of fritas! Clockwise from back left: beef, chorizo with everything ("frita loco"), chorizo with fried egg, fish. Back: Inspired Cuban, front: Cuban Sloppy Joe (basically, a brioche roll filled with picadillo, which is excellent). Sides: clockwise from left, "beans, rice, salsa, and cheese", black beans, coconut ginger rice. Plantains: back, with cinnamon sugar; front, twice-fried ripe plantains. Zamaan Cafe — photo tour! Happy (belated) New Year! I wish you all a 2011 filled with wonderful food. Long time fans of Ali Hijazi's various restaurant endeavors mourned when he closed La Zamaan on State St., but Ali couldn't stay away from the restaurant business and now he's back with Zamaan Cafe at Plymouth Rd & Green. Our January review, of course, is up at eCurrent (and you should go read it for descriptions etc.) but here is the full photo spread for your enjoyment. As always, click on the photo to see a larger version. Karnabeet — fried califlower dressed with tahini. Heavenly. Baba ghannouj — eggplant, tahini, and garlic. Kufta Harra — grilled ground beef and lamb, and Joe's absolute favorite entrée here. Last week, I went to Frita Batidos with some friends/co-workers for lunch. The space is casual, with white picnic tables and some bar-style seating at the window. The old Cafe du Jour space has been renovated from the tiny cozy lunch room into a contemporary casual white box. Really, it's quite casual, and really, quite white, and really, quite boxy (well, rectangle-y). We must have hit a pause between rushes, because the tables were full but there were only two couples ahead of us. I was envisioning a line out the door given that we were going to this much-hyped restaurant in its opening week, so that was something of a relief. Though by the time we ordered and found some seating space, the line had quadrupled in size. You place your order at the counter then find a space to sit if you're eating in. The servers will bring out your food and call your name a la Zingerman's Deli. Everything is a la carte. There's a nice selection of Cuban-style Fritas plus some other sandwiches like pulled pork, a selection of sides, and assorted drinks, including the batidos (shakes) that are half of the restaurants name-sake. And my friend Barb had the pulled pork sandwich and a side of really delicious coconut-lime rice. I suspect the pulled pork is going to be the next sandwich I try there. I'm still thinking about that rice, though perhaps not as much as I'm thinking about these garlicky plantains, being photographed by my friend the awesome photographer Tafari. We finished off our meal with some passion fruit batidos and Spanish hot chocolate. The hot chocolate was thick and deliciously sludgy, just like Spanish hot chocolate should be (order with a churro for the proper Spanish hot chocolate experience), and heavily flavored with cinnamon. And the passion fruit batido? Well, I think Tafari's expression describes how he felt about that batido. Hot Pot with Mushroom and Pork. We had to lead off with this one, because it's so cool. And because it emphasizes our point: I bet you didn't know you could get food like this at Middle Kingdom! Mushroom Salad: light and fresh, with both shiitake and the less-seen enoki mushrooms. The photo from the article, in case you wanted a closer look. 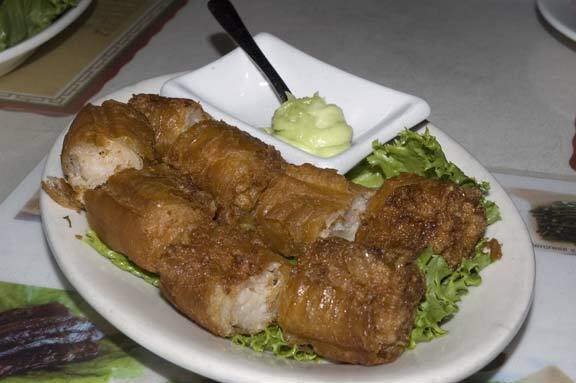 Our all-time favorite, Fish Fillet with Bean Cake Soup (#51). Just look at all that red chile goodness. Not as spicy as it looks, but don't drink the broth (too oily), just fish the pieces out like you're supposed to. Pi Pa Tofu, aka Deep-Fried Tofu with Assorted Vegetables (#226): we have to work very hard not to get this each time we're there. Spectacular dish, boring name. If Johnny hadn't recommended this we would never have known about it. Beef with Hand-Made Noodle Soup: A surprise hit. This could stand as a meal for one on its own, and probably does in its native land. See the article for a description. Been a bit distracted with other things, but we do have some additional photos from our Current review of Ayse's Cafe. Head on over to ecurrent.com to see the article (and vote for us if you feel like it), and then check out the photos below. Or do it in the opposite order; we don't mind. Some mezzes. Rear: lentil balls (cold); Front: grilled peppers; olive, walnut, and pomegranate salad. The photo used in the Current article. They bring a mezze tray like this around at weekend dinner. Clockwise from left: lentil balls, grape leaves, spinach pie, grilled peppers, olive-walnut-pomegranate salad, beet salad. Center: Potatoes and carrots. Spinach stew (eggplant salad in rear). Lamb with Apricot and Almond. Not mentioned in the review, but really good. Lamb kofte with eggplant. Mentioned in the review. Excellent. The dessert tray. Clockwise from far left: yogurt cake, chocolate pudding, carrot halwa, Noah's pudding (throw in two of everything? ), Alice's pudding, kadayif, sour cherries in rosewater. Center: Hasan's chocolate brownie. Squash with walnuts in simple syrup. Asia City is the large new Chinese restaurant on Washtenaw next to Hua Xing. We've been watching this massive building go up with some interest, hoping it would be a giant Hong Kong-style place like we've seen in the LA suburbs, fearing it would be Yet Another Nasty Buffet. Turns out it may be both. It's got a decent-looking menu, with a lot of genuine Hong Kong dishes on it, as well as the usual Americanized pretenders. It's also got a giant buffet area (it wasn't open when we were there, but the name tags were up, and it definitely looked like the usual stuff, so not very exciting... though they did have an "open kitchen" area where buffet patrons could get things cooked to order, we'll see). We haven't tried either of these. And it's also got Dim Sum, with service from carts, so it's going directly up against Great Lake (which also has carts on weekends) as well as Lai Lai (which is checklist-only). However, they're set up to do some stuff we previously hadn't seen around here, like frying items tableside directly at the cart. And they have some new items. We're all for this; if it makes all three places step up their game, that means more and better Dim Sum for us! What we had was good, but on the expensive side. We're going to show you some photos now, and circle back with them in a while to actually review them because there's no point in reviewing a restaurant during its first week. You shouldn't hold off on eating there, though: if you like Chinese food, check it out. Well, the menu and the dim sum anyway. Egg custard tarts. We both felt they're the best we've had, possibly ever. Hence they lead off the photo set. Lobster balls. Served with a peanut curry sauce (in background), which is a great addition to the local dim sum scene. Shrimp in rice roll. Generous sauce, but a bit soggy. Pan-fried cakes with shrimp and scallop. Slightly underdone. Other batches we saw were browned better. Shrimp paste around sugar cane. Nice addition. We usually think of this as Vietnamese. Congee with dried scallops, thousand-year eggs, and who knows what else. Assembled tableside. For February, we took Current readers to Great Lake Chinese Seafood (corner of Packard and Carpenter, entrance on Carpenter) for dim sum. It's an old favorite of ours, though we've never written up the dim sum before. Read about it at ecurrent.com (and vote for us if you like the article) and check out the rather large array of photos below! Remember that you can click on any of the photos to see a larger version -- and you'll want to with some of these! Great Lake has both a dim sum menu (check off the dishes you want them to bring to your table) and -- on weekends only -- a series of carts that come around with things that aren't on the menu. In the captions below, assume everything's available from the menu unless it specifically says it's only on the carts. Our table, maybe 2/3 through the meal. In foreground: deep-fried custard buns, curried baby squid. Just behind them, left to right: Chinese cruller in rice roll, pan-fried sticky rice, shrimp dumplings. Behind that: crispy taro turnover, shrimp and garlic chive dumplings (I think)... and it's getting too blurry to tell. The specials cart! Front to back, then left to right: stir-fried Chinese broccoli, baked hot dog buns (better than it sounds! ), sesame balls, baked BBQ pork things, chicken turnovers, and fried squid tentacles in the back. Fried squid tentacles! Cart only; get them when they're fresh and they're amazing. Steamed BBQ pork buns. A dim sum staple, and Great Lake does a good job with them. Salmon on the Beach (front and back), Zen (middle). Salmon on the Beach normally comes with cream cheese, but we got it without and thought it was fine. (We don't "get" cream cheese as a sushi roll ingredient.) The Salmon on the Beach is glazed with a spicy honey-sauce and torched. The Zen is topped with a sliced jalapeño and white tuna, with eel sauce, and tempura shrimp inside. Thanks to reader Faye for the tip on Nagomi Sushi & Noodle, on Plymouth Road in the same small strip mall as Bagel Fragel. Nagomi has been open just one month, which we consider to be a little too soon for a full review, but we enjoyed our meal and wanted to share. Nagomi Spicy Tuna and Tamago. The Nagomi Spicy Tuna is only on the lunch menu, but Faye recommended it and they'll do it at dinner if asked. We thought it was outstanding; it used a solid hunk of maguro covered in their own in-house made chili sauce (sweet, with honey and chili paste, very unusual). The tamago was nice, and not overly sweet. Hamachi and Scallion hand roll; not a huge quantity of fish, but nice flavor and well-formed. Tori Kara Age (fried chicken) appetizer. The chicken was perfectly cooked, and the coating very thin and crispy. We thought it could have used a bit of salt as seasoning, but perhaps the expectation is to use soy sauce? Kitsune Udon, featuring the same sweet tofu skins used to make inarizushi served up hot in a bowl of udon noodles. Spice it up with some nanami togarashi pepper blend. Nagomi's ginger dressing is different from the usual ginger dressing found at Japanese restaurants in the area. With seven fruits in the mix (we're sure of apple and know there's some citrus too), it has a mellower yet more complex flavor. I hope all our eCurrent readers had a wonderful Thanksgiving. After a break in November, we're back with a review of Amadeus Restaurant in December's eCurrent magazine and our accompanying photo essay here. Enjoy the photos! The interior of Amadeus, looking toward the front door. Bartek's Breakfast: herbed (and very tasty) scrambled eggs, accompanied by a massive slice of smoked salmon over two potato pancakes. Polish Breakfast, known to Polish speakers as Jajecznica: a mound of those same scrambled eggs, covered with slices of Amadeus's custom-made kielbasa and accompanied by two potato pancakes. Susan Barruzza on "Angel-Cake Surprise for your fanciest party!" Marla on "Angel-Cake Surprise for your fanciest party!" Cookie monster to host snl on IMBB 20 Round Up Part 2: Sweet joy befall thee! Binary Options on IMBB 20 Round Up Part 2: Sweet joy befall thee! Online Slots on IMBB 20 Round Up Part 2: Sweet joy befall thee! gives me a a shout out. Thanks!